Ben Shoval's Blog: What if Warren Buffett Were Paid Like a Hedge Fund Manager? What if Warren Buffett Were Paid Like a Hedge Fund Manager? Warren Buffett has generated amazing returns for investors in Berkshire Hathaway. Yet his salary is just $100,000. Most brilliant investing minds – and even mediocre ones – do not work so cheap. In this post I explore how Buffett and his investors would have fared if Buffett were paid like today’s hedge fund managers. The results are truly astonishing! For 50 years, Warren Buffett has produced truly remarkable results for anyone able to buy and hold shares in Berkshire Hathaway. Investors have enjoyed compound annual gains in book value of 19.4%. More incredibly, Buffett has been willing to do that work for a tiny fraction of what even mediocre investment managers get paid. His salary is just $100,000, a year in which Berkshire Hathaway earned nearly $20 billion dollars. Most brilliant investing minds do not work cheap. 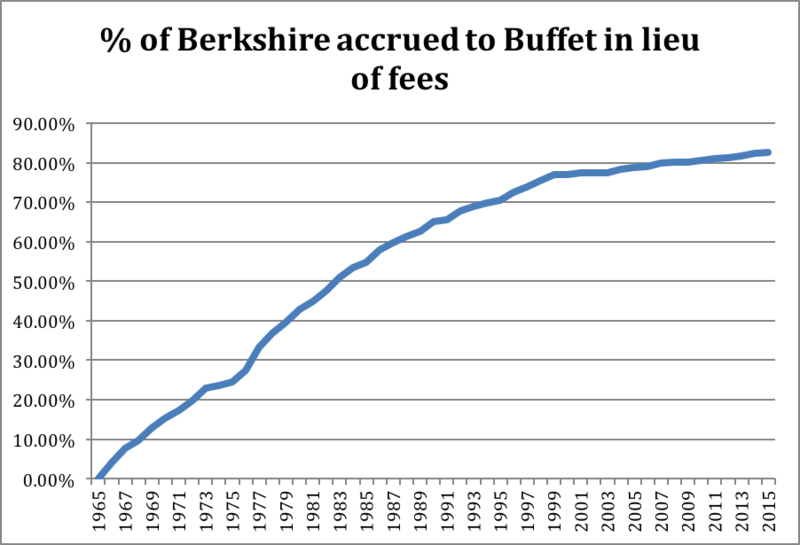 So it’s worth considering how much investors in Berkshire have gained – and how much Buffett has lost – from his willingness to toil for so little pay. The typical hedge fund manager makes money in two ways. He or she receives 2% of the book value of the fund each year in what is called a “management fee”. If the fund has $100 million in assets, the management fee is $2 million per year. A hedge fund manager also gets paid a performance fee, which is generally 20% of the gains each year. If that $100 million fund were up 15% in 2015 (that is, it made roughly $15 million), the manager would be entitled to $3 million. 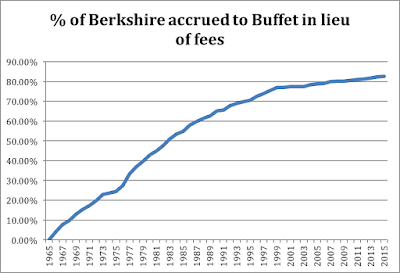 Applying hedge fund fees to the past 50 years of Berkshire Hathaway’s returns is quite remarkable. The 19.4% return investors have enjoyed is reduced to 15.4%! While this handily beats the 9.9% return the S&P 500 delivered, the compound difference over a half-century is simply incredible. At 19.4%, the Work-for-$100k Buffett produced a total return for investors of 751,113%. With hedge fund fees, that return would have been reduced to 130,554%. The difference would have gone to Buffett. At the end of 2014, Berkshire had a market value of $369 billion. Buffettt owned $79 billion of this. The many investors in Berkshire owned the other $290 billion. Hedge fund managers frequently do not take their fees in cash. Instead, they receive an equivalent portion of the fund as compensation, allowing their ownership to grow over time. If Buffett had followed this system for the past 50 years, his net worth would be approximately $319 billion instead of $79 billion. The share of the company owned by all the other investors would be about $50 billion instead of $290 billion. Buffett’s loss is Berkshire Hathaway’s investors’ gain. To the tune of $240 billion dollars! * Annual returns, compound annual gain, and overall gain are from page 2 of Berkshire Hathaway, Inc.'s 2014 Annual Report (available at http://www.berkshirehathaway.com/2014ar/2014ar.pdf). The report includes the following note: Data are for calendar years with these exceptions: 1965 and 1966, year ended 9/30; 1967, 15 months ended 12/31. ** Raw returns are calculated from the annual returns in the 2014 report and therefore suffer from the effect of rounding and the reporting inconsistencies in the note above, though neither effect is significant. A 2% management fee is charged at the beginning of each year. A 20% performance fee is charged at the end of each year, above a high water mark.